At Har HaShem, we have youth groups for 3rd through 12th grades that help our youth build community, Jewish identity, and leadership skills. Tzofim is Har HaShem’s third through fifth grade youth group. Tzofim activities focus on making sure our youngest youth group students have sound foundations of Jewish learning, are having fun, and are engaged with one another in building the youth community that they will walk through religious school, b’nai mitzvah, and eventually confirmation with. 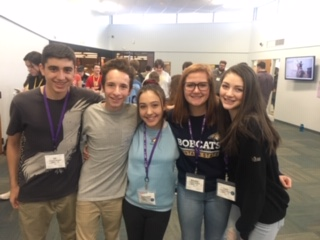 Tzofim students have one social event every month, and are encouraged to attend Youth Shabbat, as it exposes the youngest of your youth groupers to JYG (Junior Youth Group) and BTY (Boulder Temple Youth), and gives them the chance to see their older peers in action. Our older students set the example for our youngest, and the interaction often results in unofficial mentorship that benefits all of our students. Tzofim is a wonderful way to get your youngest students involved with their peers and engaged in Judaism. JYG (Junior Youth Group) is Har HaShem’s sixth and eighth grade youth group. JYG typically holds a monthly social activity, a monthly Youth Shabbat, a regional overnight MV (Missouri Valley) NFTY event, and an overnight retreat. All events center around Jewish learning, community building, and engaging students in Judaism’s most sacred traditions. Eighth graders are also encouraged to enroll in the 8thgrade class; in which students are focused on deepening their Jewish learning by exploring Jewish teachings that help them understand real world topics and issues they confront in their middle and high school years. Boulder Temple Youth (BTY) is Boulder's largest 9th thru 12th grade Jewish youth group, and a member of the North American Federation of Temple Youth (NFTY). All programs are planned by a student-run BTY board including social, cultural, social action events, as well as the popular Tube N' Tub Overnight in the mountains, monthly club events, and many, many more fun local events and overnights. This is in addition to the three to four weekends a year at the regional NFTY Chavurot! Youth Shabbat is a special Shabbat service held once a month for kids and teens in grades 3-12. It is planned and led by the youth group board. These services are fun and interactive!